Critical systems demand time-aware high-availability networking. Moreover, the complexity of the modern network infrastructures in these premises overcomes the traditional concept of “managed” device. 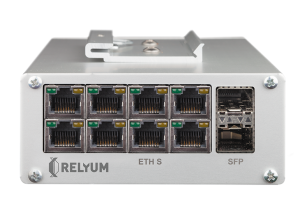 RELY-RB is a new concept of intelligent device that integrates advanced field-proven technology for non-packet-loss redundant Ethernet, sub-microsecond synchronization and cybersecurity. This device is able to merge the whole LAN with redundant networks, to interconnect PRP and HSR networks and to extend HSR rings via QuadBox operation. RELY-RB family comprises three different models, based on the number and type of communication interfaces available in the equipment.